Holiday Wishlists Make Shopping For You Easy! We know that holiday shopping for collectors can be tricky for friends and relatives who may not be very familiar with the items you collect. Well, we’re here to try to make that easier for everyone this holiday season! 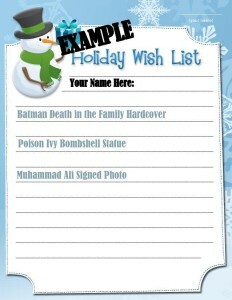 Come down to the shop at any time and fill out your Holiday Wish List. 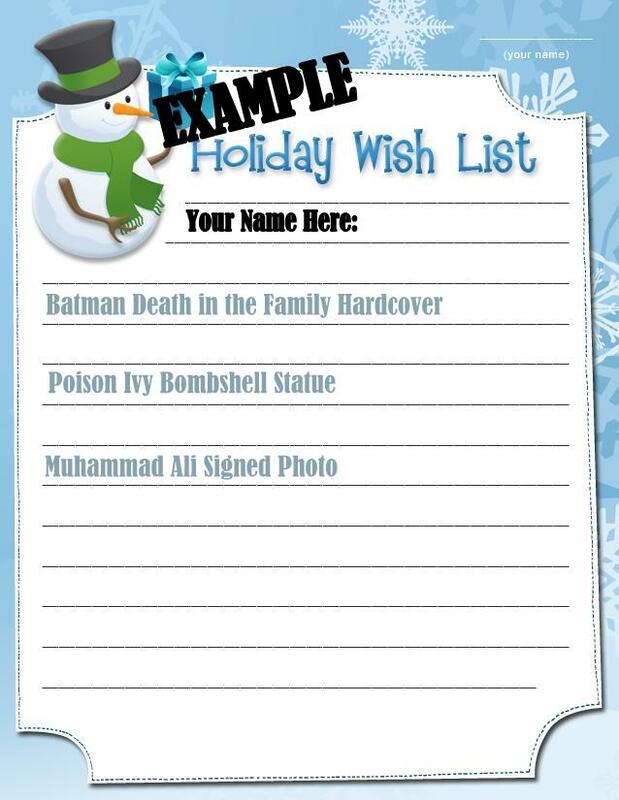 All you have to do is write up a list of items you’d like to add to your collection (toys, statues, specific comic book issues, a certain baseball card, etc) and we’ll keep your list on file. You can mention to your friends and relatives that you have a wishlist here and when they come in to shop for you, we can help them choose the perfect gift for you based on your list! Some folks can get pretty intimidated walking in to a collectible shop when they are not collectors themselves, hopefully this will eliminate any hesitation! Plus, it keeps the surprise of gift-giving alive as you won’t know which item they choose from your list! Any questions, don’t hesitate to call or e-mail us! This entry was posted in General Info on November 4, 2013 by admin.